Ask fellow campers about "General Coffee State Park" and nearby attractions. We really enjoyed our stay at General Coffee despite gnats (many) and rain (lots). We'd been to the park in the past, so knew about the trails (great!). GC is known for the gopher tortoises and we nearly ran over one on arrival in the campground! Our site backed up to the gopher tortoise trail. It was great for morning walks. We had the campground almost entirely to ourselves. We rented bikes and road around the back country camping area. We fished in the pond by the historic farm and we did a long hike out through the East River Swamp Trail to Yellow Jacket to the Orange River Equestrian Trail. Note - the trail out behind cabins 1-4 seems to be somewhat confused. It didn't quite follow the map. But it was a nice hike anyway - mosquitoes and gnats were annoying, but it is mid summer and we had a lot of rain. Our site in Campground #2 was pretty level - not sure any of the sites would be "bad". They are all pull throughs. Campground #1 roads are a bit rough, particularly if you have a large camper/motorhome. There are no grey water dumps as are found in some other state park campgrounds - keep this in mind as there's no sewer hookups at G.C. Moderate cell access on Verizon and ATT without using a booster. The pond in the historic park has a small farm with lots of critters. There's also feeding stations for ducks. The turtles by the bridge are used to being fed - this is why when you walk on the bridge there are suddenly turtles everywhere. LOL! Bike and Boat Rentals. Staff is very friendly and helpful. We camped at General Coffee State Park in a Travel Trailer. Tidwells Chicken (Carters) 1065-, 1077 E Baker Hwy, Douglas, GA 31533 Great fried chicken. Stayed only 2 nights. Cold and rainy. Definitely want to return to explore more. Campsites worked very well. Our friends had a 38 foot 5th wheel and found an easy space to set-up. Dump station at entrance. We camped at General Coffee State Park in a Motorhome. Great boardwalk and historical buildings worth a look. Small town nearby in case you forget something. We stayed only one night. I wish we could have stayed longer and had time to explore all the features of the park. It has a lot of historical buildings and many trails. We only had time to do the trail where the tortoises can be found. We didn't see any but it was the wrong time of day. The campground is an unusual state park in that all the campsites are pull throughs. Most are quite spacious. Also you cannot reserve a specific site. You make a reservation to stay at the park and then individual sites are first come first served. We enjoyed our stay and will try to get back again to finish seeing everything. We camped at General Coffee State Park in a Travel Trailer. Plan to unhitch and go see the historical village four and half miles from the campground near the entrance if you can. We missed it and I'm sorry we did. The employees are friendly and helpful. The park has a few things to do and is well kept. Not a whole bunch to do in the nearby town, but it has all the shops you need. This is one of our favorite Ga State Parks. We used to come here a lot, then they closed the pool and it wasn't as great a place to camp anymore. 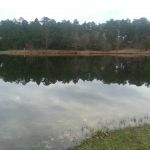 Ga state Parks needs to adopt reserved sites. I have been going to Fl State Parks more lately just because I can reserve certain sites and they are cheaper then Ga State Parks. It's getting old arriving at the park and seeing most of the sites have been claimed early in the morning even thought the people don't show up until late that night. It'd be nice to reserve a site and know you won't be on a small site with a large RV. We camped at General Coffee State Park in a Motorhome. First off do not be fooled by anyone saying this park sets next to a river; it's a cypress swamp, not a river. The park is nice for walking on nature trails, seeing wildlife, and general camping. If you're looking for somewhere to cool off in the summer, this is not it. Campground One is old but I thought it had the best campsites, and while Campground Two is newer it seemed to have more of the cookie cutter style camping areas Staff is friendly and helpful, they made the stay more enjoyable. We stayed over 4th of July, the City of Douglas puts on one of the biggest firework shows in the southeast. 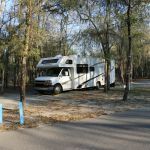 We camped at General Coffee State Park in a Fifth Wheel. Walmart, Lowes and other stores about 6 miles down the road. City of Douglas does have a swimming pool, just isn't open every day. This is a beautiful park with some wooded trails to explore. There are 2 campgrounds. Campground #2 is the better one as it has paved interior roads and gravel sites. Campground #1 is dirt/sand roads and campsites. You are not on the river but can get there via trails. There is no over the air TV at all. I saw one satellite but don't know if there was a signal as it is very wooded in the camping area. The town of Douglas is about 6 miles away and has a Walmart, CVS drug store and a number of fast food restaurants. Staff was very friendly and helpful. We had to ask to have a dead limb removed that had fallen and was stuck above us in some vines. The maintenance crew was at our site quickly and removed the limb along with 3 truckloads of other vines/branches that might have been a hindrance when we had to leave. We camped at General Coffee State Park in a Motorhome. This is a small but very nice park. The campsites are almost all long pull through loops. The restrooms are older but well maintained. It's very flat so leveling is not a problem. There is some interesting hiking in the park and a demonstration farm that is interesting for kids. If you use Groupon - there have been 40% off coupons running for most of 2016. Check and see. 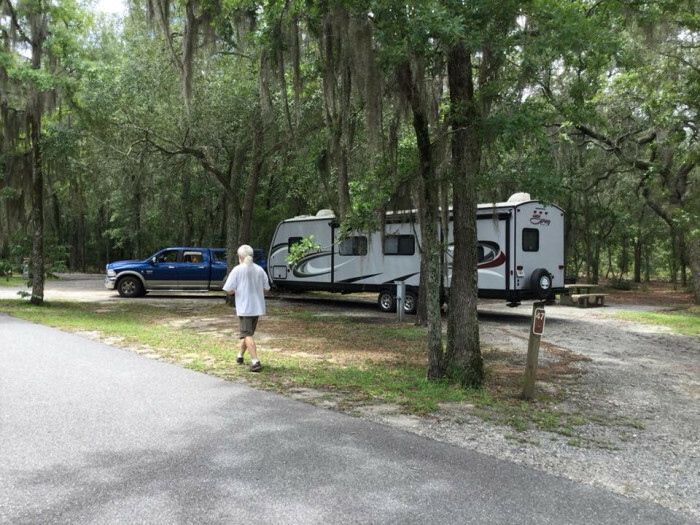 We camped at General Coffee State Park in a Fifth Wheel. This is a very quiet park, well away from the interstates, etc. We stayed here over a weekend and absolutely loved it! The sites are nice, the staff is wonderful, and the park is well kept. There are plenty of trails, a nice large pond for paddleboating/kayaking, and a well stocked camp store. The staff make everyone feel welcome! There is one downside, some of the trees are starting to encroach on the road and some of the campsites. Not a huge problem, but becoming a problem nonetheless. If you are looking for restaurants or things to do, Douglas isn't very far, and they have quite a bit to do there. The Flying Cowboy (located at the airstrip) restaurant was very good. We will be back, as this is an excellent get-away location! We camped at General Coffee State Park in a Travel Trailer. All of the sites are pull-throughs, but some are longer and wider than others. I'd suggest driving through once before deciding where to park. $30 per night was for a level packed sand pull-though site with 50-amp electric and water. Our site, #22, was completely shaded by large moss covered trees. The large site had a concrete picnic table and fire ring. It was pleasantly quiet during our stay, even over a weekend when families with children arrived. A Heritage Farm on site takes one back in history. There are four miles of hiking trails and 13 miles of equestrian trails. The facility is well maintained and very attractive. There are many activities available, which you can find listed on their website. The nearby town of Douglas has shopping if you need to pick up anything. AT&T and Verizon service was good. We received three digital over-the-air PBS TV stations and many radio stations. We camped at General Coffee State Park in a Motorhome. Very nice and clean state park. Check in at the small store at the main entrance and then choose any open spot. The campground is in the very back of the park, so it's a bit of a drive. There are two different camping areas. We ended up staying in the upper one. I suggest driving through each to see the open spots before choosing one. We tried a couple different ones until we found one we really like. There is a nature trail from the camping area to the farm at the front of the park -- just be prepared for a bit of a walk (bring water and snacks). Overall, we enjoyed camping here and would return. We camped at General Coffee State Park in a Motorhome. Beautiful park stayed two days, would have stayed longer if we had time. Great shady big sites. Water and electric no neighbors which was wonderful. We camped at General Coffee State Park in a Motorhome. Lots of hiking, interpretive center, town nearby. Very nice state park. If they had sewer I'd give them a 10. The site was fairly level and was a pull-through. Campground was clean, and the ambiance was just what you'd expect for a state park--very woodsy. Shopping/restaurants were 15 minutes away. Not all sites are 50 amp, but they have quite a few to choose from. f.y.i. - If you are going with a group who are staying in the cottages, they are far away from the campground. You must drive out of the park and go through another entrance to get to the cottages. That was a little inconvenient, but we managed. We would stay there again if in the area. We camped at General Coffee State Park in a Motorhome. This is a beautiful park with live oaks, long leaf pines and so many other trees that every space is shaded. Every site is also a pull-thru. There are great hiking trails and a wonderful variety of birds. We enjoyed listening to the frogs and owls at night. The park includes a heritage farm that offers a small museum and a number of farm animals. The goats, chickens, sheep, ducks, turkeys, horse, mule,pigs and donkeys eagerly look forward to treats from visitors. The farm pond is nice for fishing. I took away a star due to the lack of WiFi at the campground. 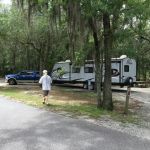 We camped at General Coffee State Park in a Fifth Wheel. Their was only one loop open when we got there, since demand is low during mid-week. Very friendly and helpful hosts. 20% discount if you're over 62. There is good data coverage and great cell coverage here, too. We hiked about five miles on a great trail along the river. It's very quiet here with the sound of trains in the far distance. We'd love to come back. We camped at General Coffee State Park in a Motorhome. This was a good spot if you want to get away from it all. There is no internet, TV, cell service. It's just you and nature. If that is what you want then bonus. If not, well you will be bored within 3 hours. Lots of shade, nice pull through semi-circle sites. The campground host was awesome and was welcoming us within 2 hours of our arrival. He even let us know where some extra (free) firewood was. Showers/baths were nice and big. Plus a super big bonus was there was a lock to the outside door for added privacy. The only reason I am giving this an 8 is it advertised a pool that was closed due to budget cuts. Nothing said this on the websites so we were disappointed. Also we had a late check in (after 5) and there were no posted instructions on what to do. We camped at General Coffee State Park in a Motorhome. Are you affiliated with General Coffee State Park ?